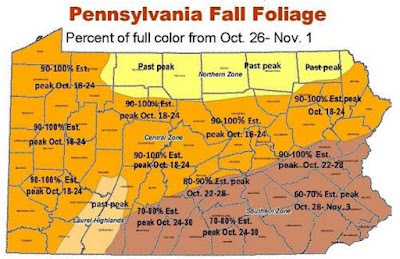 The Department of Conservation and Natural Resources Thursday issued its latest Fall Foliage Report showing Pennsylvania’s Fall foliage is still in full splendor in southern regions of the state. The southern half of the state is generally at or nearing peak foliage, as the sustained warm-weather trend has led to a protracted fall foliage season. Peak colors are observable in a diversity of central regions, including parts of Buchanan, Rothrock, Tuscarora, Weiser, and Delaware state forest districts. Moshannon State Forest is still the standard-bearer for color, statewide. Excellent fall color exists in northwestern Pennsylvania, as well as oak-dominated regions of Sproul, Tiadaghton, Tioga, and northern Bald Eagle state forests. Areas of Monroe, Carbon, Luzerne, and Schuylkill counties in the southern Pocono region are currently particularly vibrant. 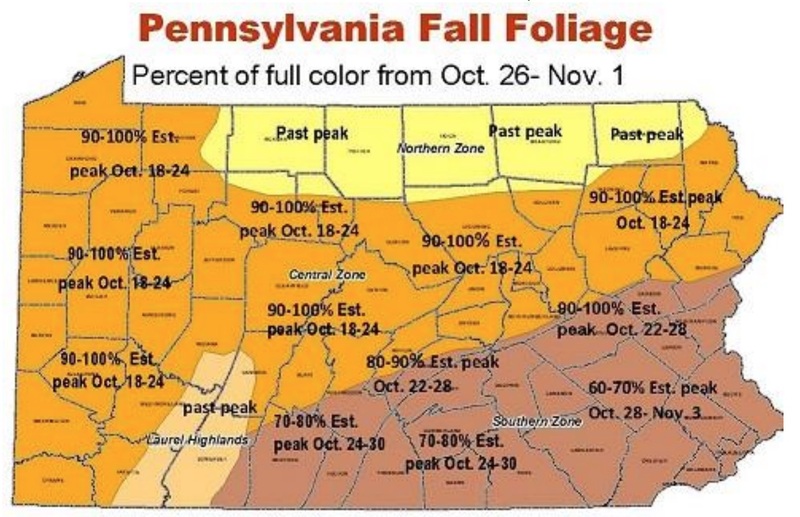 Beautiful peak colors are expected soon in the southcentral Pennsylvania Appalachian Mountains and Ridge and Valley regions. For more information on the status of foliage around the state, visit DCNR’s Fall Foliage Reports webpage.